Maldini has been at Milan all my life and then some, I literally dont know football without him, I grew up looking up to this guy. I remember in the 94 world cup watching him missing 1st grade classes then 98 I got some perspective on how big of an idol this man is. Now to see him retire is just weird, I cant imagine the emotions that will be going through the San Siro when he has his last home game, i really do think tears will be flowing much like when baggio had his farewell. Maldini has played for Milan longer than iv been alive!! This man is my hero and i can honestly say there has been no better gentleman like player than Maldini he is the model pro, i cant put into words how much of a legend the man is! More than any other footballer he seems to have sprung from the serious imagination of a child. The world he belongs to is not the rough, touchy, deceiving world of grown-up risks and chances but a world of lucid justice and simplicity. And just as a child's prayerbook suggests a high-up fairness in the external order of things, a cloudlike God at the roof of the cosmos dispensing rewards to the virtuous, so his career seems to have unfolded at the center of a halo inside which blessings fall on those who deserve them, power emanates from wisdom, and the beautiful is a manifestation of the good. Now, there's a sense in which football is always giving off intimations of this sort of world, and in that sense the feeling it gives us resembles not so much a childish sense of right as a peasant's consent to hierarchy, doomed to exalt the bearers of an unfathomable grace. There's a danger in that feeling, which may explain why, in a democracy, the press is always set against footballers and against that exaltationÃ¢â‚¬â€the more angrily and vulgarly against it the more of the people the press styles itself to be. So in a way the innocence of football is cowed on both sides and awakens a terrific resentment. But in Maldini's case none of that seems to apply. He's simply permitted a space of innocence, as if the system needed one true shining prince, as a bathtub drain, so to speak. Fancifully, because who knows whether philosophy matters to the body's moving parts, I've always thought it was this forthrightness, this way of living directly and without the frictions and reverses of a life of unclear purpose, that accounted for his amazing longevity. At almost 41 he plays like a 28-year-old and looks permanently established in the main of light. He made his first senior start for Milan on the day Ronald Reagan was sworn in for his second term in office, two weeks before the current king of derided tabloid idols was even born. Cristiano Ronaldo was named after Ronald Reagan, whom his father adored, but Maldini (whose middle name is Cesare, his father's name) was named after a dynasty. And belongs to one. His retirement, which is now only days away, strikes me as having an actual tragedy in it, because it's the one accommodation he's ever had to make to the indifference of the world to meaning. If meaning were everything he could go on playing forever, racing marvelously down the left side of the pitch to pluck the ball from attackers half his age, keeping his cool and keeping his team alert to the objective. But meaning has no purchase on the sinews, and virtue has no existence in the physical world, and he, too, will be tossed upon rough seas. His pace is already gone, and his unassuming lightness of touch, always so strange and breathtaking in a defender as powerful as he was, would only be a little easier to sustain than the strength that, through innumerable scuffles, supported it. And the tragedy of this is that his growing old gives the lie to the vision of the world that his career almost made us believe in. Beauty isn't goodness and power isn't wisdom, even if, in the world's haphazard mergings, they might briefly coexist. Blessings are arbitrary, even if they sometimes fall where they're deserved. Still, illusory though it may have been, the fullness of the congruence he achieved made him a consolation, and we'll remember him for that, and it will color what we mean when we say he was better at what he did than anyone who ever played the game. Almost without trying, he made us perceive a world that was better than the world we knew. The first time I paid serious attention to Paolo Maldini was at the 1988 Euro Championships in Germany where he excelled with our Azzurri! From there he went from strength to strength and it's a shame the biggie escaped him, a World Cup winner's gold medal...he's achieved everything else! I think this thread title is disrespectful to some other Milan players. Beckham, Shevchencko, Ronaldinho, Ba, Brocchi and numerous other legends. The year is 1985. Ronald Reagan and Mikhail Gorbachev are figureheads of the cold war. At Heysel Stadium 39 spectators are killed at the European Cup final. Live Aid concerts raise Ã‚Â£50m for victims of famine in Ethiopia. DNA is first used in a criminal case. Roger Moore steps down as James Bond. And a 16-year-old coltish defender with a famous name makes his debut for Milan at half-time in a Serie A match at Udinese. He is the son of Cesare Maldini, a former European Cup-winning captain for the club. He trots on at half-time and glides through his overture on impressively long, strong, limbs. He looks calm, classy, eminently comfortable. Milan's fans reckon young Paolo is a chip off the old block. Some 25 seasons later, his footballing achievements beggar belief. This weekend the 41-year-old pulls on the shirt of the club he joined at the age of 10 for the 901st time. With more than 1,000 professional matches under his belt Ã¢â‚¬â€œ every single one of them in the rossonero of Milan or the azzurro of Italy Ã¢â‚¬â€œ Maldini will make his farewell bow at San Siro. His career has cranked on and on, past so many milestones (they announced they would retire his No3 shirt several years ago) it is hard to know where to begin honouring the end. The club's official website has tried to sum it up with a simple tribute that has run all week long: 25 SEASONS. 900 GAMES. ALWAYS AND ONLY MILAN. GRAZIE PAOLO! A quarter of a century in the first team of any club is a staggering enough feat. To do it at one of the world's elite teams, sweeping up five European Cup medals and seven Serie A titles along the way, sets a benchmark that looks unmatchable. To put it into perspective, 35-year-old Ryan Giggs would have to play on for Manchester United for another seven years to equal Maldini's length of service. Real Madrid's RaÃƒÂºl, who turns 32 in the summer, will need to continue for another 10 years. This is a man who has won the European Cup in three different decades. There will be no special party. It is his choice. He just wants to use the last two games of the season to say goodbye, first to the people who love him at San Siro, then to the greater family of Italian football with an away game at Fiorentina. The man has always done things with irresistible, understated charm. And that is the real legacy of Maldini. The statistics only tell part of the story. They don't tell you anything about the elegance and gallantry with which he played. All the negative stereotypes of Italian defensive arts Ã¢â‚¬â€œ niggling and pinching and sly shirt tugging Ã¢â‚¬â€œ were unnecessary for Maldini. Probably the best left-back ever created played purely as well as powerfully. He has so much going for him it is hard to know if he is more adored by the men or women of Italy. But Maldini has never been big-headed. Always professional. His reaction to his landmark 1,000th game (a 0Ã¢â‚¬â€œ0 draw at Parma) said it all: "These are numbers which will remain in history Ã¢â‚¬â€œ too bad we did not get the three points." So what next for Il Capitano? Milan are almost certain to find a role for him within the club if he wants it. Likewise the Italian Football Federation. But he will take a well-deserved summer holiday. "I want to pull the plug out for a little while, at least until September. Only then will I think about what to do with my future." That is unlikely to be in coaching, though, which he describes as "the job which unites all the things that I don't like about football together". The end of the fairytale? Not necessarily. The third generation of Milan's Maldini dynasty, Paolo's 13-year-old son Christian, plays for the club's junior ranks, and over one million people have viewed a video of his youngest, Daniel, effortlessly dispossessing Clarence Seedorf on YouTube. If Paolo gets half as much contentment watching his boys as Cesare did, it won't just be Milan who are the lucky ones. Watching the recordman throughout his extraordinary career has been a pleasure for all of us. Grazie Maldini! The absolute best! Words can't describe how much I respect this man. He's undoubtedly a true legend who will be missed by all Calcio fans. I wish him all the best in his life. AC Milan captain Paolo Maldini reacted with fury at the negative treatment he received in his final game at the San Siro by a small section of his club's fans. Maldini, who criticised fans earlier this year when telling them to get behind the team during their struggles, was stung by some of the banners in the stands. One in the south stand read: "Thanks captain: on the pitch you have been an infinite champion but you have lacked the respect of those that have made you rich". Another one read: "For your 25-year glorious career our deepest thanks from those you defined as mercenaries". That banner was accompanied by a big jersey of Franco Baresi, who Maldini replaced as captain, and with chants of "There's only one captain". 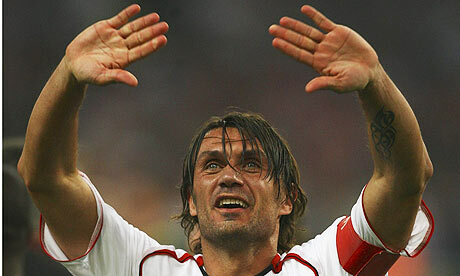 Maldini said of the fans who hung the banners: "I am proud not to be one of them." AC Milan coach Carlo Ancelotti was equally disenchanted by what happened. "It was only a minor section of the crowd," he said. "But they could have avoided that in what was supposed to be a special day for Paolo." Roma won the game 3-2 to make it a very disappointing send off for Maldini. EDIT:P.S. If anyone wants Maldini's last home game, its in the .